This tiny break in the shell is called a ‘pip’ (above pic). 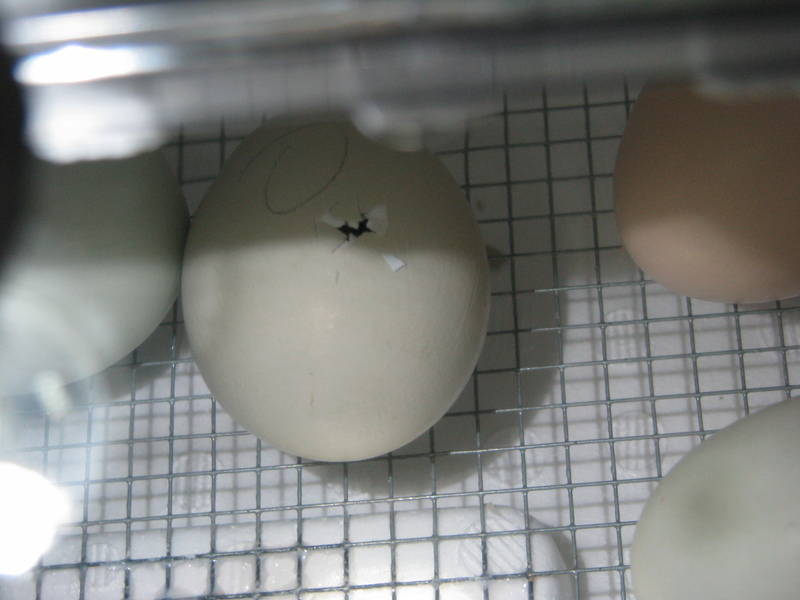 The baby chick has broken through the inner membranes to make a tiny hole, and to put a tiny crack in the shell. Baby chicks will remain in this phase for as long as a day. You have to remember that the chick has been scratching non-stop for hours with the tiny ‘egg tooth’ on their beak to get to this point. They need some rest! Here’s the next phase. The chick has now opened up the pip and is enlarging the hole. He’s getting ready to…..
ZIP! This is my favorite part of the hatching process. You can see that his sibling is eagerly awaiting his arrival. The ‘zip’ stage is where the chick literally zips all the way around the egg. This part goes fairly quickly. That baby chick is READY to get outta there now. He’s out of there! Now it’s just time to dry off, which takes several hours. My hatching percentage wasn’t great at all…likely due to the fact I was inexperienced with hatching bird eggs (I have hatched reptile eggs 100% in the past). This time around, I am trying a higher humidity level since I went and checked humidity with a hygrometer under a brooding hen and found it to be around 60%. I’m currently setting more eggs at 99.5 to 100 degrees with the humidity around 50-52% and at the 2 week check, which was yesterday, I only had 2 eggs not develop further after my Week 1 check, so I’m excited! Right now I have 11 ‘Easter egger’ eggs and 4 Silkie cross eggs. 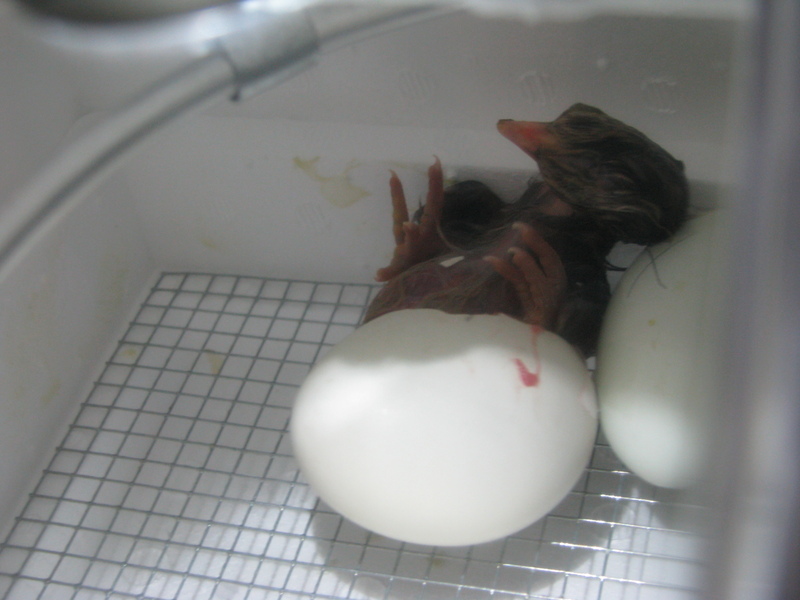 Here is the shell after a good hatch. 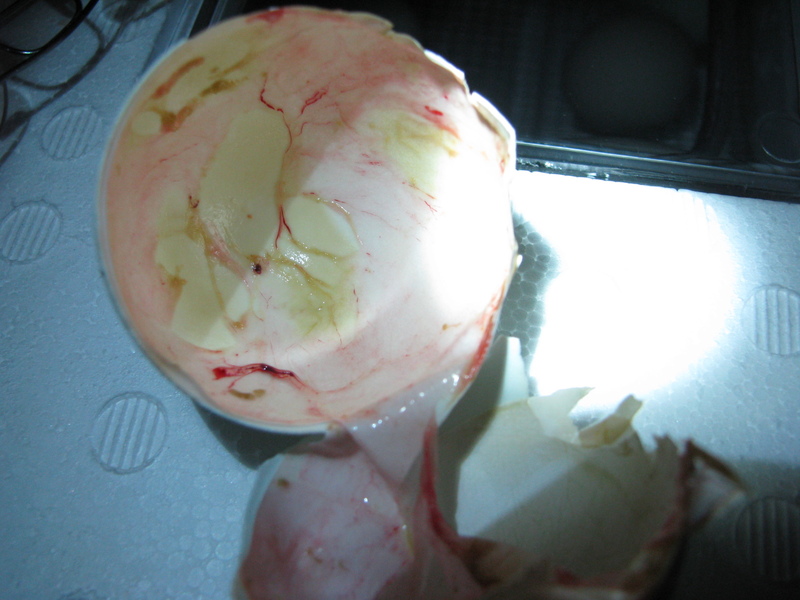 There are 2 inner membranes in the shell. The first one closest to the chick contains the blood vessels which have sustained the chick in utero, if you will. It is a very thin, clear membrane. The next membrane is a tough, whitish membrane. If the chick takes too long to hatch, this membrane will dry out too much, causing the chick to suffocate/die in the shell. This is another reason why correct humidity is so critical. You’ll see that there is a little pink…this is just where the vessels were. 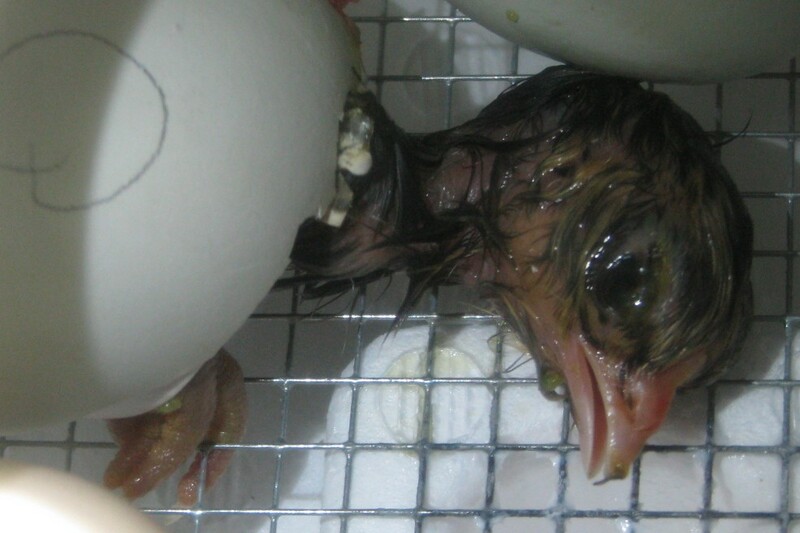 The chick absorbs the blood which was in them during the hatching process. This is why you CANNOT just peel a chick who is almost ready to hatch out of the shell. Doing so will cause massive hemorrhaging and death to the chick. I have ‘helped’ some chicks hatch, but it is an extremely slow, delicate procedure that must be done in gradual phases, over the course of many hours. 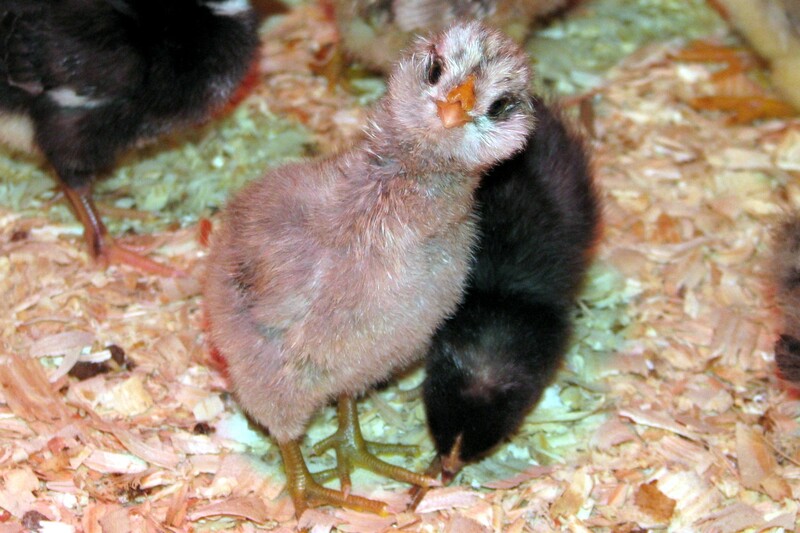 Now here’s some cute and fluffy pics of the chicks at a few days old. 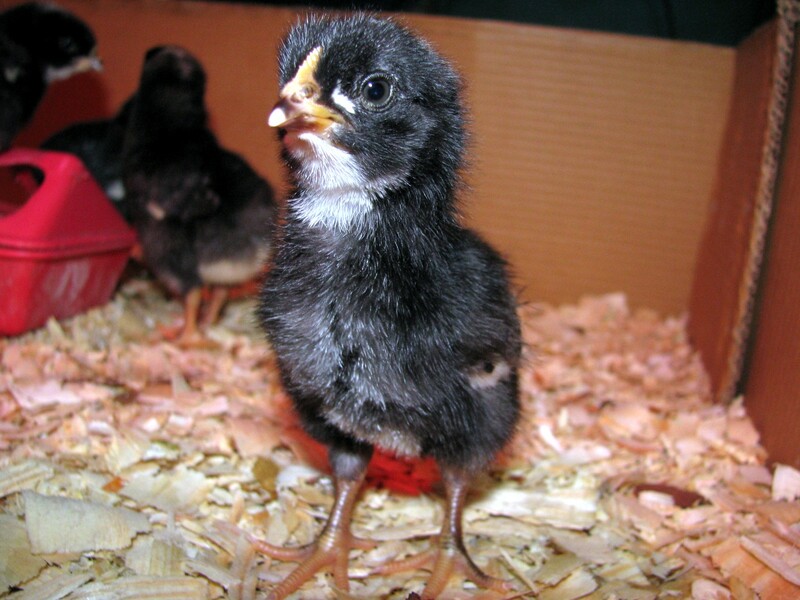 The black chicks, which are Barred Plymouth Rocks, are not the ones I hatched myself. And, how do YOU do? A very special thanks to the Swanson family for allowing me to hatch their eggs! Oh my goodness. This is so cool. 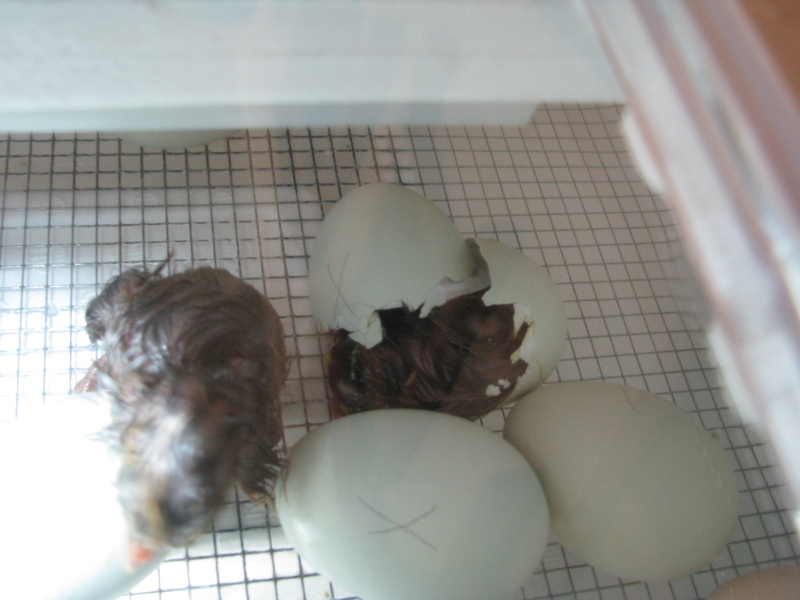 I never really thought there was so much to chick hatching… But, why put them in an incubator? Why not just let the mother deal with all this? Well… nevermind. Great experiment idea! The picture are really cool and cute. Can’t wait to read more. There are several reasons to use an artificial incubator. Yes, having a broody hen is best, but you have to have a broody hen first! Just because a hen lays eggs does not mean she will ‘go broody’. This means that she is in the incubating mind set. Many, if not most, modern breeds of chicken actually will not ever ‘go broody’. Unfortunately, this crucial trait was not passed on. This means that they will lay an egg, and just walk off. 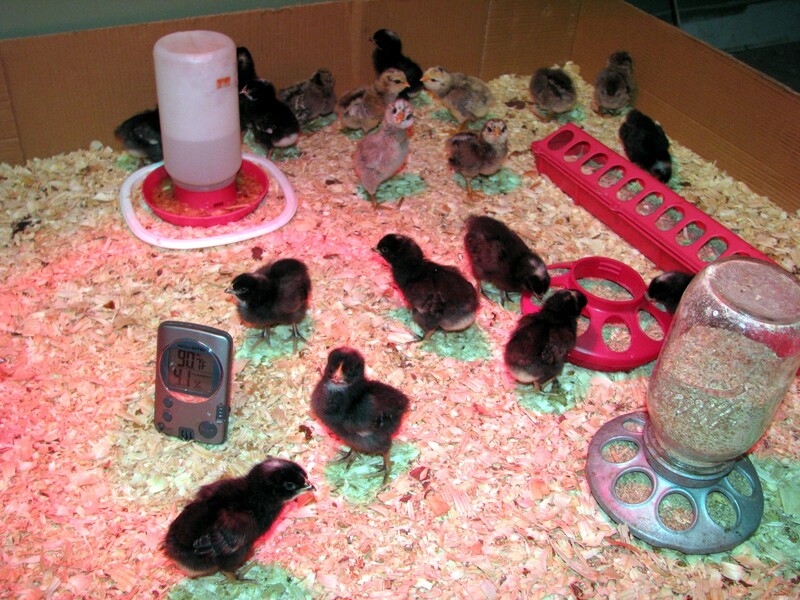 Broody hens faithfully sit on their eggs for the required 21 days, and then tend to the chicks. I actually have 2 broody hens right now, and one which hatched 3 eggs a couple of weeks ago. Also, hens may go broody after only laying a single egg. As soon as eggs are incubated they begin to develop rapidly. You want to incubate all of your eggs starting on the same day, so that they hatch the same day. The mother hen won’t sit and wait too long for ‘late’ eggs. Swear to me the next time I buy eggs from you a baby chicken won’t be hatching in the carton. You did really great on the last dozen. There were no blood spots. I love your blog. I am sending my sweet Agi the one on Wayward. She is from Poland and that is how I became Mama Linda. She will love it. She is Jason’s significant other. We love her dearly.